Katrina is the former lead singer of Katrina & The Waves and is one of the few women from the 80s who is still performing and recording. 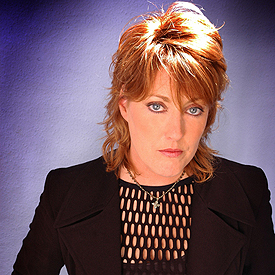 Born in 1960 in Kansas, U.S., Katrina Leskanich moved to England in 1976. Growing up with the West Coast sound (Fleetwood Mac, Linda Ronstadt, Emmylou Harris, Heart) she, together with fellow American and future Wave, Vince de la Cruz, formed the band Mama's Cookin'. As a singer, Katrina was inspired by Motown, Dusty Springfield and girl groups such as The Shangri-Las and The Shirelles. In 1983 Katrina and Vince joined The Waves (a Cambridge based band with ex Soft Boy, Kimberley Rew) and she picked up on some of their musical influences such as Etta James, Velvet Underground and the Stones. The band became Katrina and the Waves, and after two albums and five years washing dishes she became an international pop star with the massive hit 'Walking On Sunshine', which has become a timeless summer anthem. During the same year Katrina and the Waves were also nominated for a Grammy for best new artist. 'Walking On Sunshine' has been used in countless films - American Psycho, Secret of My Success, Look Who's Talking and Hi Fidelity to name a few, and numerous commercials. It was even covered by Dolly Parton. Exclusive Magazine recently sat down with Katrina Leskanich and asked her some questions about the 'Walking On Sunshine' phenomenon, her new live CD, and, of course ... penguins! Taking it from the top and Katrina and the Waves actually started out life as The Waves, before you joined another version of them, then-named Mama's Cookin'. It specialized in covers of songs by American acts (Heart, Foreigner, ZZ Top, etc.). So, thinking back to those days, what was it like as an American playing British gigs with American songs? "Mama’s Cookin’ was formed and designed to cater to American service men and women on the USAF bases around the UK. I was managing the band at the time and would phone up the Entertainment manager at each base asking to be considered for bookings. Living, growing up and being educated on military bases overseas is like being in an American bubble where we would still use dollars on base and we had our own commissary and stores, bowling alley and clubs where the servicemen and women would go for drinks and some entertainment." "We offered something unique in that the music we played was American performed by Americans and for Americans. It worked. Later on when Kim joined we did a tour of RAF bases and tried to fashion the music around a British audience." Although, initially, you were only lead vocals on the cover tunes, Kim Rew began to write original material especially for you to sing. This soon led to you being the primary vocalist. Indeed, The Waves made their initial recording appearance on a 1982 single, 'Nightmare'/'Hey, War Pig!' What was it like having had so much time spent in the shadows to now be singing, and recording as a lead vocalist? "I am singing with Kim on 'Nightmare' and 'Hey War Pig' and I never felt as if I was in the shadows. Working on Kim’s first album was another project for me and a priceless opportunity to work in a studio and learn parts and be in the presence of someone very committed and driven and also unique and talented." Indeed, just after that, and a few band member changes, the band was rechristened as Katrina and the Waves. Now that must have been a fantastic, inner ego-boastful day for you. Was it just that? "I was not bothered about being singled out with the re-christening of the name to include Katrina. I loved the girl groups and the something and the somethings had a nice snappy ring to it. It was still a novelty for a “girl” to be in a band and somebody in the business called “the Bishop” thought we were missing a trick and suggested it. We thought it was useful to have a member name as people seemed to identify us a bit better." In early 1983 the band, at your own expense, recorded its first album, 'Walking On Sunshine' - but found it was only going to be released in Canada! How did that sit with you at the time? "It was Alex Cooper and his wife (our manager) remortgaged their house to pay for the recording. I was very excited to be signed by any label and being signed in Canada gave us the chance to tour solidly back and forth across the country before getting signed by Capitol." 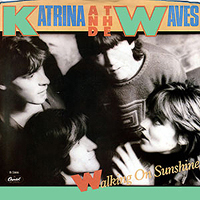 The album, primarily due to the title track single, then garnered a lot of radio play, BUT it wasn't until you signed to Capitol Records and re-recorded, remixed, and even overdubbed those 10 songs from the few years before, that the Katrina and the Waves album 'Walking On Sunshine' was a substantial and commercial success. And then the title track single went on to be an instant worldwide hit. So, what was it like living in your head at that point of time with all the acclaim and adulation being foisted upon you all? "It was what we hoped dreamed and expected (in our naivety) would happen if we stuck with it year it after year. The material had the chance to evolve and improve over the years and that first album (being a compilation of two) was already almost a “best of” so we thought it really deserved to do well. It was fresh and honest and energetic and with the help of Capitol Records and endless touring and promotion it seemed like an overnight success. For me, success was a novelty and everything a first. We handled it because we were a cohesive group. We had our bubble and not too many people were allowed in." And just how did the single 'Walking On Sunshine' come to be in the first place? Where were you - emotionally and physically - when you first started to put it together? "Kimberley presented 'WOS' like any other song, just played it on the guitar and sort of showed Alex the beat he had in mind ('You Can’t Hurry Love'). I thought the song had something because I couldn’t get it out of my head for about 4 days." "Vince (bass player) said he thought it was irritating. Kim thought they were both good signs. When we played the song live at the RAF clubs tho it went down like a lead balloon and was a dance floor emptier. People were listening to Joy Division etc… and they didn’t relate to the beat or the sentiment. We stopped playing it live!" But, it has to be said, follow up singles and albums never quite made it to the same level of radio play / audience adulation as the debut single / album. In reflection, why do you think that was? And, in hindsight, what would you now do differently to what you did back then? "WOS hit so big and was considered novelty already so it was a hard act to follow. Of course people kept saying 'all you need is another WOS.' 'Do You Want Crying' did well and 'Sun Street' worked well in the Europe. After our second Capitol album and the payola scandal we concentrated on record deals and a career in Europe." After a step away from the limelight, Katrina and the Waves came back in 1997 by winning the Eurovision Song Contest for the UK! And amazingly, given the worldwide hit of 'Walking On Sunshine' that had gone before it, this winning song 'Love Shine a Light' then became the bands biggest-ever UK hit, peaking at #3 in the UK Singles Chart! After all that time off, how proud were you of yourself, your win, and of where you stood at that moment in time? "The ESC was the perfect opportunity to reintroduce the band and raise our profile all across Europe. Whatever anyone thought about the band once they heard the song they were hooked again. I was proud to win for the UK with a positive enlightening song full of hope and joy." Please tell us more about your latest album release, The Live Album - and what you would like people to get about it "Katrina and the Waves never released a live album so as I was touring so much in 2010 I decided to record the shows and release one myself. It was easier and much more fun than sitting in a studio going 'one two, one two'!" You have been labeled, as a band, one hit wonders ... but does that sit with you well, or would you have it written another way, perhaps? "Probably the label one hit wonder could be construed in America and I could list all the other songs we had that performed well in the charts. But it doesn’t really matter to me and I am very happy and proud of 'WOS.' And if it is all I am remembered by I am ok with that." 2010 was the 25th anniversary of the release of 'Walking On Sunshine'! Wow, that must have flashed you back when you were informed of this fact! Where have all the years gone, Katrina? "They’ve gone like bits of chaff in the wind!" Do you have any tattoos and, if so, and as we're not called Exclusive Magazine for nothing, what are they of and where are they located?! "No!" Lastly, and throwing you a journalistic curve ball, Exclusive Magazine love penguins ... do you, perhaps? "I don’t have anything against penguins. Ask John McVie about penguins and he can show you his penguin tattoo as well!"